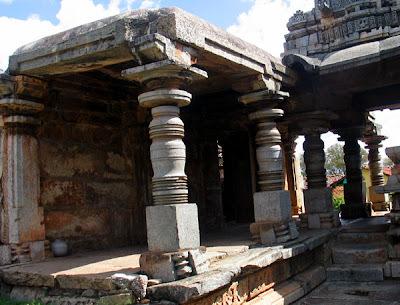 The Viranarayana Temple of Belavadi is supposed to be the best and the largest Hoysala monument surviving. This temple complex encompasses most of the Hoysala architectural features and was built in two different stages. In its first stage, an Ekakuta or a single celled temple was built with a Garbhagriha, an Antarala, a closed Sabhamandapa and open Mukhamantapa. This part of the temple was built by the great Hoysala king Vishnuvardhana after converting to Hinduism from Jainism, under the influence of the great saint Ramanuja. 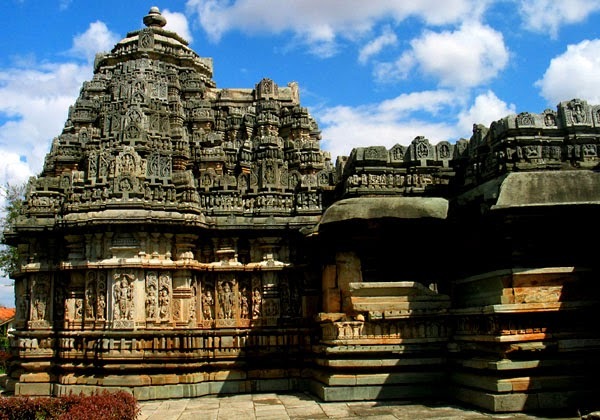 It was built as a mark of devotion towards Lord Vishnu who is referred here as Viranarayana. 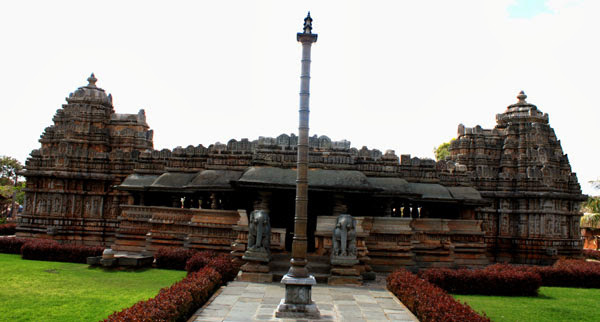 Amongst the three temples of the complex, Viranarayana is the biggest and the simplest. In its second stage of construction, a transversal strip with Ankanas, a Mahamandapa attached with 2 Garbhagrihas with Antaralas on the northern and southern sides and a Mukhamantapa towards the east were added, making it a conglomeration of 3 temples in one. These additional temples were built in the early 13th century under the king Ballala II. 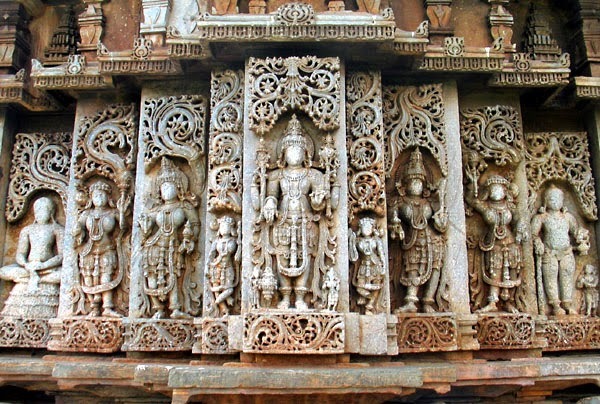 They are smaller in size and very ornate on the exterior, much in contrast to the Viranarayana temple. 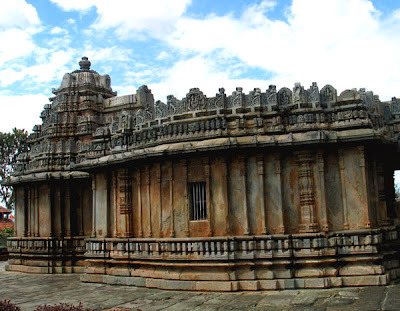 While one of the temples is dedicated to Lord Venugopala, the other is dedicated to Lord Yoga Narasimha. 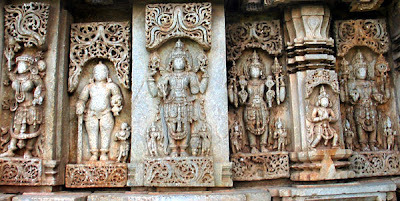 There is a continuous series of beautiful sculptures of different forms of Vishnu just below the Shikara (eave) of the temple. The Shikara of the Viranarayana temple has 3 talas, whereas the Venugopala and Yoga Narasimha temples have 4 talas, which makes the uppermost hemisphere of the Viranarayana temple a little bigger in size than the other two temples. 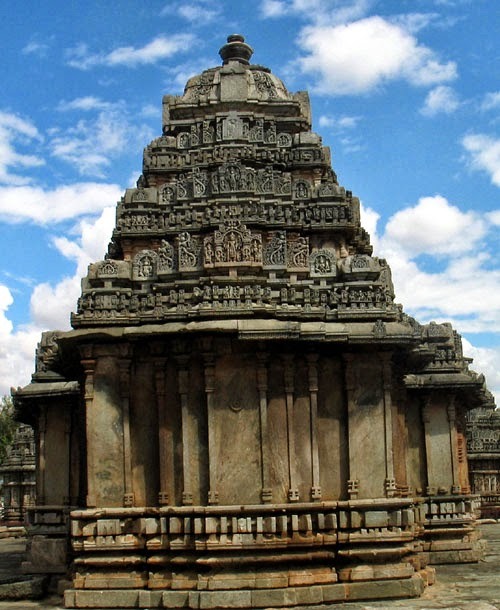 The original temple of Viranarayana and the temples of Venugopal and Yoga Narasimha are connected by an elongated mantapa, which is the only structure that looks out of the place. 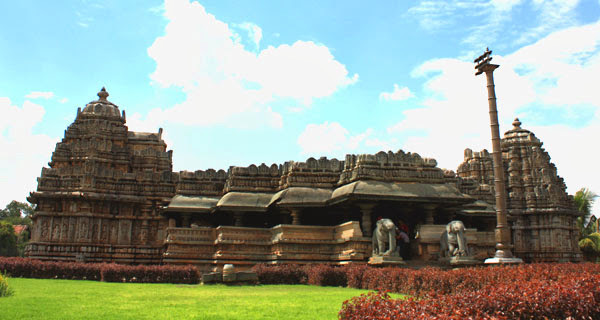 There is a beautiful and a unique entrance/Mahadwara which is bedecked with two huge elephant sculptures to welcome the visitors. 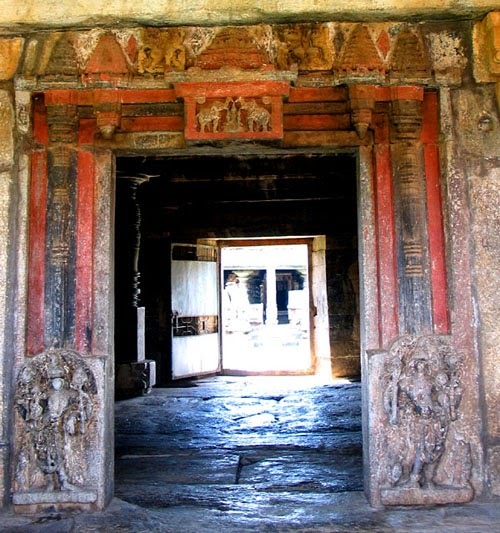 This entrance is very big and has a few inscriptions and some old sculptures. 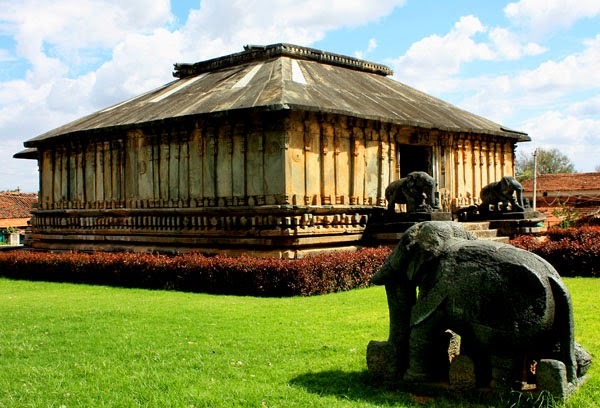 There is a beautifully maintained garden surrounding this temple, adding to the beauty of the temple. The temple and its premises are very well maintained by the ASI, with a permanent care taker. Beautiful pictures and wonderful informative narration!!! Wonderful captures and coverage of the temple. I love the peace and the quiet of the garden surrounding it. 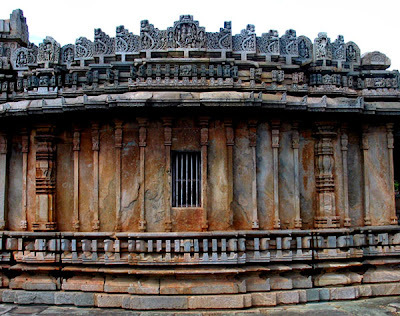 A temple of incredible beauty brought out through your amazing pics ! 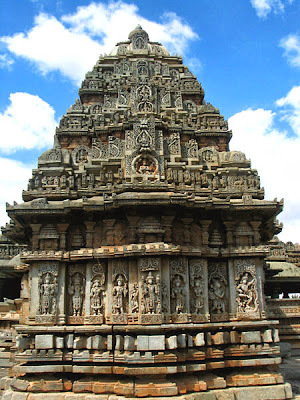 It is a beautiful temple and a big one at that as well. One of the best in our state. Photos are lovely. 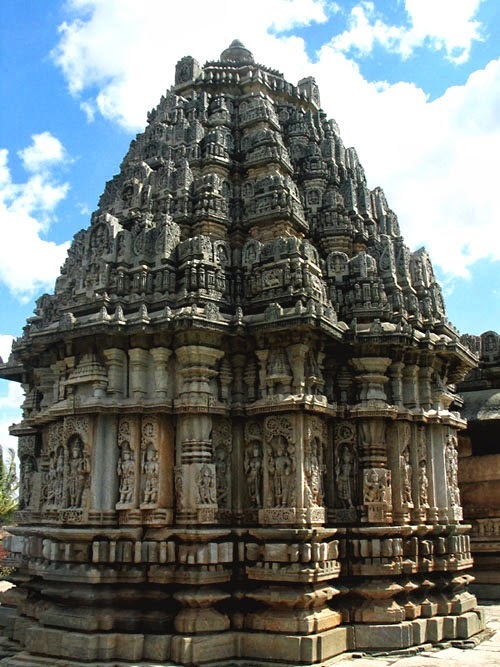 Beautiful temple and looks quite well maintained. Excellent post! oh wow this is impressive! 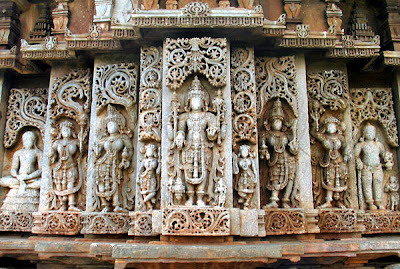 i am always so amazed at the intricacy of the temples there! just so much detail to get lost in! Incredible temples and so colorful! I, too, am amazed by the intricacy and detail! Superb captures as always! And thank you for the wonderful information you include! 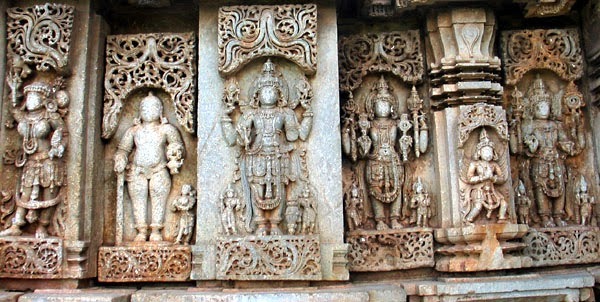 The carvings in the architecture are amazing. Architectural masterpiece. Beautiful shots of the temple. Wow, this is absolutely magnificent. Lovely photographs!! Amazing stone works! Thanks for bringing this beauty. Those architectures are absolutely magnificent. beautiful captures TGS, loved the description. Lord Vishu's sculpture are excellent.!! loved it.